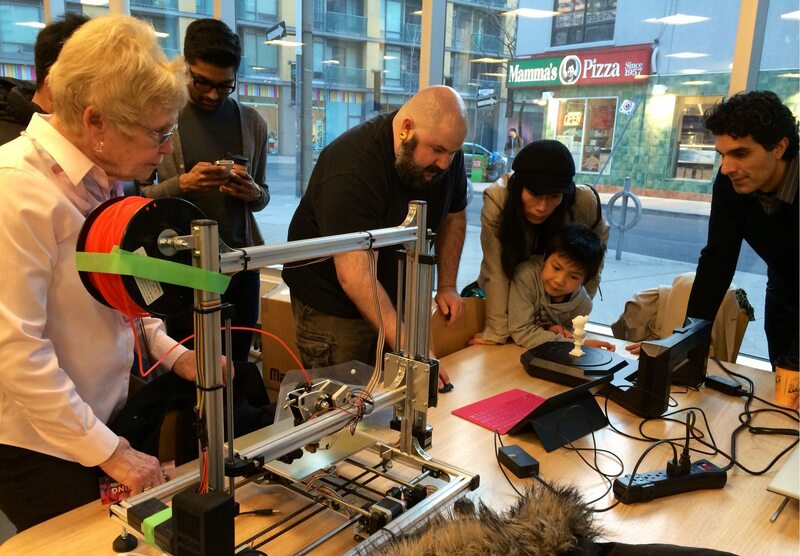 Expert Derek Quenneville introduces patrons to 3D printing at the Toronto Reference Library. Derek Quenneville shows guests how to use the Makerbot 3D scanner at the Toronto 3D Printers MeetUp in March (Photo by Toronto Public Library). If you don’t know how 3D printing works, you’re not alone. Derek Quenneville, a Toronto-based expert, says it’s kind of like a glue gun. Controlled by a computer. Except the glue is plastic. And the plastic happens to build up one layer on top of another. “The mechanics of it are quite simple,” he says. Quenneville is well known in the world of 3D printing and fabrication art. He creates his own projects, runs Toronto’s 3D Printer MeetUps, and now he’s also a Toronto Public Library guinea pig: Quenneville is its first official Innovator in Residence thanks to a new six-week program launched with the TPL’s Digital Innovation Hub. Quenneville’s duties as resident innovator involve running 17 3D-printing sessions—ranging from drop-in Q&As to formally led classes—over the course of six weeks. Now in his fourth week, Quenneville says turnout has been amazing. TPL offered 300 spots for a 3D-printing certification course, which sold out in three days. The crowd is also older than he’d expected—many Torontonians in their fifties and sixties are looking to learn about 3D printing. He says—get ready for this—there’s nothing he dislikes about his job. “Just seeing people’s faces light up when they look at something that was in their brain, and half an hour later they’re holding it in their hands—it’s an incredible thing to see,” he says. Quenneville’s residency will wrap up on May 2 with a closing party, but you still have time to drop by and ask him all your questions about the creative and practical applications of 3D printing.